What types of virtual bets can I make? STRAIGHT UP: This is a virtual bet on a single number. It is placed directly on the number you want to virtually bet on. It pays 35 to 1. SPLIT: This is a virtual bet on two adjacent numbers. It is placed on the line between the two numbers you want to virtually bet on. It pays 17 to 1. BASKET: This is a virtual bet on three adjacent numbers from the two top rows. It is placed on the intersection of the three numbers you want to virtually bet on. It pays 11 to 1. STREET: This is a virtual bet on a row of three numbers. It is placed on the left most edge of the row you want to virtually bet on. It pays 11 to 1. CORNER: This is a virtual bet on four adjacent numbers. It is placed on the intersection of the four numbers you want to virtually bet on. It pays 8 to 1. TOP LINE: This is a virtual bet on the five numbers from the top two rows. It is placed on the top left corner of the number 1’s space. It pays 6 to 1. SIX LINE: This is a virtual bet on two adjacent rows. It is placed on the left most intersection of the two rows you want to bet on. It pays 5 to 1. COLUMN: This is a virtual bet on a column of twelve numbers. It is placed on the space below the column you want to virtually bet on. It pays 2 to 1. TWELVE: This is a virtual bet on twelve consecutive numbers. It is placed on the spaces labeled”1 to 12”, “13 to 24” or “25 to 36”. It pays 2 to 1. ODD: This is a virtual bet on all odd numbers. It is placed on the space labeled “ODD”. It pays 1 to 1. EVEN: This is a virtual bet on all even numbers. It is placed on the space labeled “EVEN”. It pays 1 to 1. RED: This is a virtual bet on all red numbers. It is placed on the space labeled “RED”. It pays 1 to 1. BLACK: This is a virtual bet on all black numbers. It is placed on the space labeled “BLACK”. It pays 1 to 1. LOW: This is a virtual bet on the numbers 1 through 18. It is placed on the space labeled”1 to 18”. It pays 1 to 1. HIGH: This is a virtual bet on the numbers 19 through 36. It is placed on the space labeled “19 to 36”. It pays 1 to 1. How do I place a virtual bet? 1. From the Lobby, tap Roulette. 2. Choose a roulette room. 3. 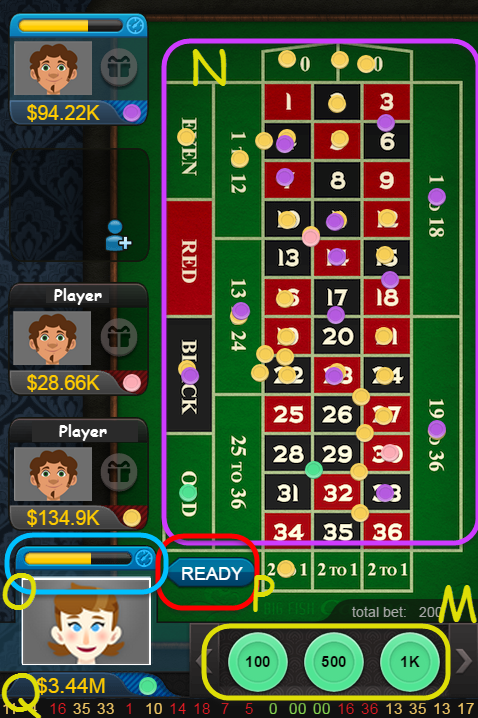 Drag your chips (M) onto the board (N) to make your virtual bet. You can place as many chips on the board as you desire. 5. Press the Ready button (P). The numbers at the bottom indicate previously spun numbers (Q). For more information, please check out our Roulette Guide.